Check out confirmed details about Group D Teams, Schedule, Predictions for the upcoming 2018 FIFA World Cup in Russia. As if the Iceland fairy tale hadn't brought enough joy, their first ever World Cup match will be against Argentina in Moscow. A group of coincidence, Nigeria will play against Argentina for the fifth time. Skilled Croatia poses a threat as well. Runner ups of 2014 world cup Argentina, Messi and his company will be making their eleventh consecutive appearance. Argentina is considered as one of the best teams in world football but last time they won the world cup, it was 1986. Adding more in vain, they were defeated in finals of Copa America in 2015 and 2016 both times by Chile. Debuting their way to the world cup Iceland is the least populated country in the competition. In European Cup 2016, they stunned big dogs like Portugal and eliminated England in the round of 16. Croatia is making their fifth appearance. They finished third in 1998 and could not move further group stage later that date. They finished third below Brazil and Mexico in the previous world cup. African nation Nigeria has not been able to move further Round of 16 till date. The 2013 African champions were eliminated by France in 2014 after qualifying the group stage with four points. 2 times champions Argentina is expected to secure the first position in the group. Despite qualifying for the world cup at the last match day, Argentina is the strongest team in the group. But still Argentina needs to play with the best of their abilities as other teams can be a surprise for them! Newcomers Iceland made their way to the world cup by topping the group of countries like Croatia, Ukraine and Turkey. They defeated Croatia by 1 goal to nil in their home ground. But do Iceland have the skills to get past over mighty Argentina. Croatia bounced back and defeated Iceland 2 goals to nil in their home ground but they have to wait further till the second round. They faced Greece and defeated them 4-1 on aggregate to qualify for the world cup. Currently at 17 rank, Croatia is favourable to clinch the second spot in the group. Nigeria qualified by securing the first position in the group by beating the current African Champions Cameroon. They have emerged as a better team in the recent years. They pose a threat for Croatia but Iceland can stall Nigeria. 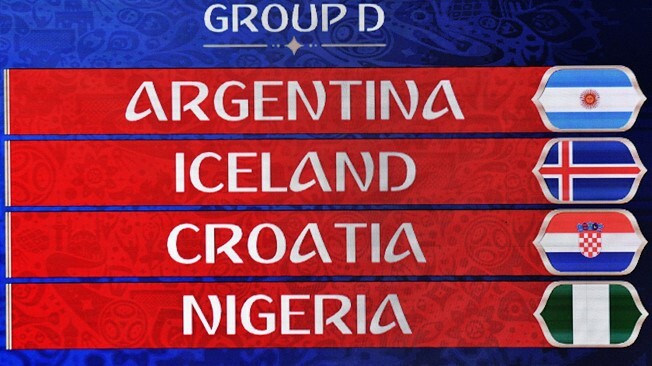 Croatia, Iceland and Nigeria will act as a challenge for each other for the second spot finish.